Family Volley: Want them to Hear You? Listen. Want them to Hear You? Listen. My husband has this old cassette tape. Remember those? It is one of the few cassette tapes we still own. The sound is gravel-ey and it reminds me of high school. The tape is full of songs by Cat Stevens. My husband introduced me to him when we got married. There is this one song with a line that says, "from the moment I could talk, I was ordered to listen"
Every time I hear the song, that line really strikes me. It is so true. Just as soon as we can talk, we are told to be quiet and listen. Contradiction, don't you think? I listen to the song and replay the line in my mind, evaluating my parenting practices and wondering if I listen to our kids, or just order them around. Do I really hear them, or do I always have my own agenda when it comes to our conversations? As a parent, do you ever feel like your kids are not listening? Or that you have to talk a lot to make them listen? Here is the funny thing. One of the best ways to get our kids to listen, is to stop talking to them, and listen to them first. How... How do we listen? First, discern how/ when your children talk. Our daughter wants to talk immediately after school, or after any and every event. She gets in the car, ready to tell me about every. single. detail. Our son is the complete opposite. He gets in the car after school and it is like pulling teeth to get him to tell me anything. At first I would push for details. Then I learned to leave him alone. It is usually about 24 hours later, when our son seeks me out and starts to tell me all the details of his "yesterday". It is after the fact that he wants to talk. On his time, when he is ready. Not every conversation requires feedback. For some reason, as parents, we feel that every conversation with our kids needs to have teaching, counseling, reprimanding, or reminding in it. It doesn't. We don't have to teach a lesson or prove a point every time we talk. Listen more than you talk. Be very selective about when it is necessary to give feedback. If we want to listen to our children, we must be at the crossroads. What does this mean? Be there at those critical moments when they leave for school, come home from school, or transition into something new. Be there when vital decisions need to be made, and be around the center of activity. As parents we have to be ready and waiting at the crossroads each day. Let go of the agenda. Most of the time, when we start conversations, especially with our kids, we are waiting for them to stop talking so we can fullfil our agenda. So we can tell them to "get started", "to not forget", "to make sure they do...". Most of the time we have an agenda for our conversation. We need to let go of the mentality that we are only listening so that we can then talk. We need to actually listen and hear what is being said. Our lives get busy. If we really want to listen to our children, we have to make time to do that. A great time to listen is during your 15 minutes a day with your child. But take a minute and evaluate your day. When else could you listen? Lately, I have been taking short walks at the end of the day with each of the kids. We trade off and while we walk, they talk. I rarely say anything. I have learned so much about our children during this time. This also means we need to be available. Put yourself in the same space as your children, even if you are doing different things, and watch as they open up and talk to you. Our kids can't talk to us if we are never around, or always busy. Ever had your child tell you the same story 15 times? Maybe every time they talk to you it is about dinosaurs, their passion for the week. No matter how tired you are of Tyrannosaurus Rex stories, don't ever shut your child down. Listen to it again, and again. Telling them you "don't want to hear it", that you "are tired of it", or telling them "not to talk about it again", will make our children feel shut down. They wont talk about the hard things, if they don't trust we will listen to the easy, everyday things. Listen by looking them in the eye. Have you ever really listened to your child? Looked them in the eyes? Watched their mouths move? Noticed the freckles and color of their hair? Have you ever really heard what they are saying without thinking about a million other things? Try it. In fact, try and make every conversation a real conversation by looking them right in the eyes. You will fall in love with your child all over again, every time. If our kids feel that we listen to them, they are much more likely to listen to us, and obey us. They will feel understood and accepted. They will want to open up and share. What do you feel when you REALLY listen to your kids? I really appreciate this post today. Thank you for the suggestions. This is great, really great. I know the song you are talking about. I was frequently squelched as a child so I try hard to listen to my kids. 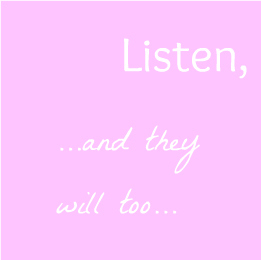 There's certainly a big temptation to be planning out your responses rather than listening in any conversation. This is an excellent reminder! Hi Leslie, Thanks for your comment. It is wonderful that you recognize how you want to change things with your kids. That is half the battle! And you are so right, it is not just with our kids that we are more worried about what we want to say, instead of listening to what they are saying. We can do that in any conversation. A good reminder for all of us, always. Here I am bawling at work. Will be scheduling 15 minutes with each child starting today. Will look in their eyes. Will listen. I am soooo so guilty of having an agenda when I'm talking to them. Will put those agendas AWAY in our 15 minutes! Thank you, Heather!! Oh, and I love Cat Stephens. That song is one of his greatest. Alicen, thank you so much for your comment. Now I have tears in my eyes. Hang in there. Starting with the 15 minutes a day is the best place to begin. I am so glad this was helpful. Thank you Cat Stephens! Alicen, you're not alone (except I'm at home, not work). I started crying on the "Let go of the Agenda" bullet point. I'm ashamed of how often I have cut my kids off to tell them "You have to brush your teeth NOW!" or whatever. Also...after 4 years I'm ashamed to admit that I have told my son "I don't want to hear it" about Transformers. I am just SO tired of it! How do I feign interest Heather? Help me! I want him to talk to me but if I have to hear about Megatron and his red eyes one more time I will poke my own OUT. I am so glad I am not the only one guilty of not actively listening to the kids. Alcien, Emily - I feel your pain. Heather - I am so glad you shared this today. I will have lots of opportunity for put your suggestions into practice...we will be in the van a lot this weekend. Love. I always feel inspired to do better, and I could do much MUCH better where this is concerned. I think my kids would behave a whole lot better if I would take the opportunities to listen to them instead of thinking "they are behaving, I'm gonna quickly do X, Y and Z!" Thanks for the motivation, as always. Your posts stay with me through the weeks and months. Ah, Heitritter Family, thank you so much for your kind comment. You are right, ALL of our kids will behave better if we take the time to really listen. A good reminder for all of us. This is great advice for any parent or adult mentor when it comes to children. fabulous, fabulous advice; I honestly believe that listened to children are happy children and that it shows when a child isn't being heard at home. Every day I am astounded by something R says to me, I wouldn't miss it for the world.